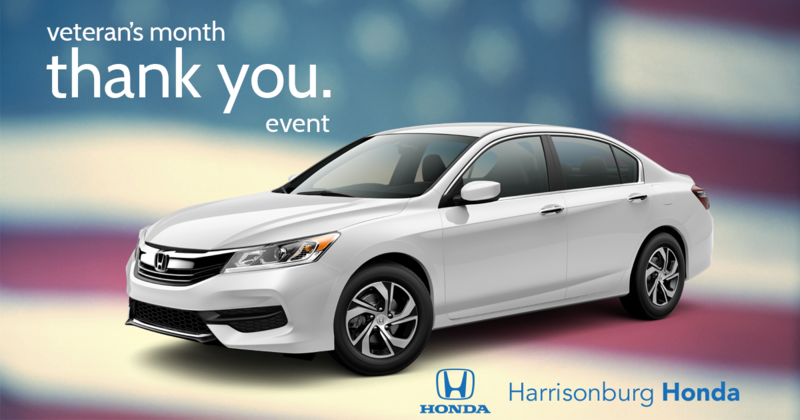 Harrisonburg Honda Wants To Thank You For Your Service! At Harrisonburg Honda, we couldn’t be more PROUD of our brave service men and women, both past and present. We want to show you our gratitude with incredible savings on your new Honda vehicle! As a Veteran-Owned business, Harrisonburg Honda knows what you do for our country and we know the value of your service to this great nation. No matter when, where, or how you have served or are currently serving our country, you deserve the very best in dedicated service and unbeatable pricing. We’re going to show you how much we appreciate you now, and always. We want to extend savings on top of savings to YOU on an incredible array NEW 2017 Honda Vehicles like the stylish Civic, the luxurious Accord, and the versatile CR-V. How much savings, you ask? 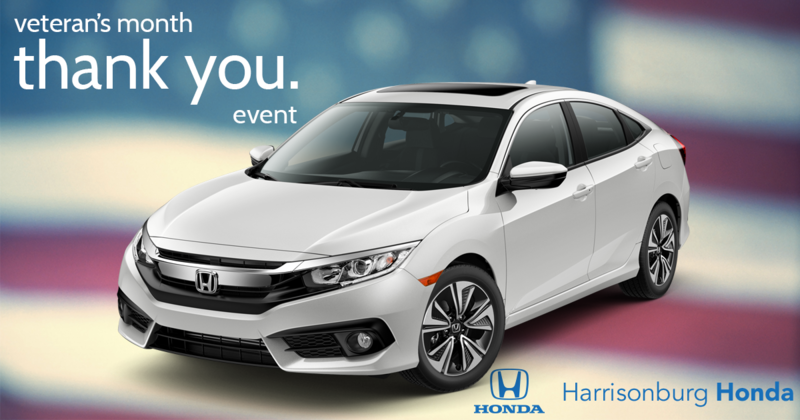 Well, as a Veteran or Active-Duty Military member, you’re going to get a fantastic discount from Honda; and we’re going to match it for you! 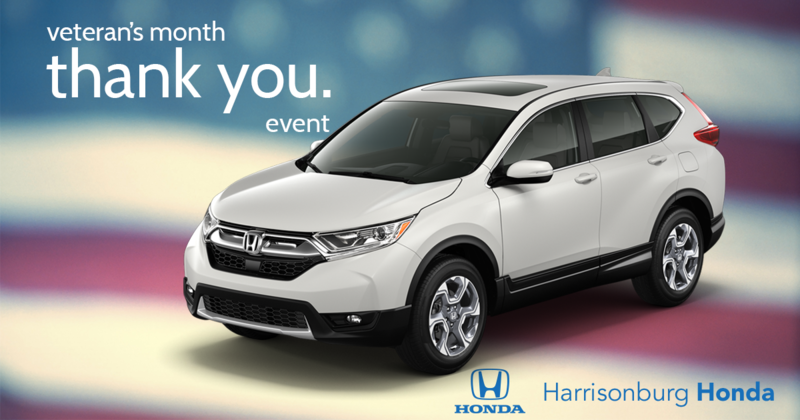 This is an EXCLUSIVE benefit to YOU, offered by the team at Harrisonburg Honda. So, if you get $500 off from Honda, we’ll give you another $500 off, as well! In fact, we will do this year-round for our Veterans. Plus, Harrisonburg Honda can throw on big-time savings with unparalleled 2017 year-end discounts, in addition to our exclusive Military Savings. You’ll also get the added benefit of an incredibly easy experience with our down-to-earth staff; as well as a Lifetime Warranty, including state inspections! With this much savings and added value, there’s no reason to go anywhere else. Let us give you the experience and the respect you deserve. We want to do our part to make sure you know how much you mean to us and to our community. Because it’s worth spelling out twice, let’s break down the unbeatable savings to YOU, our valued Veterans! An EXCLUSIVE, 100% MATCH of Honda’s generous Military Discount (available year-round)! 10% OFF Parts & Services! Incredible year-end savings on the BEST 2017 NEW Honda models on the market! Our Lifetime Warranty, including all state-required inspections (available year-round)! In addition to this unparalleled savings event, we’ve proudly partnered with local radio stations 96.9FM WSIG and 92.1FM WSVA to sponsor the “Wall Of Honor,” which recognizes the importance of our local service men and women, and their invaluable contribution to our community and our country. Throughout the month of November, the names of those local veterans will be read On-Air, as part of the Wall Of Honor. We also go out of our way to support other local, Veteran-Owned businesses like Mission Mulch, and are proud fundraising sponsors of the Fine Earth Adventure Race, benefitting K-9’s For Warriors. With that in mind, know that we do whatever we can to help the brave military Veterans of our proud community.